Don't Miss He Named Me Malala - Sam Enjoys & Shares! 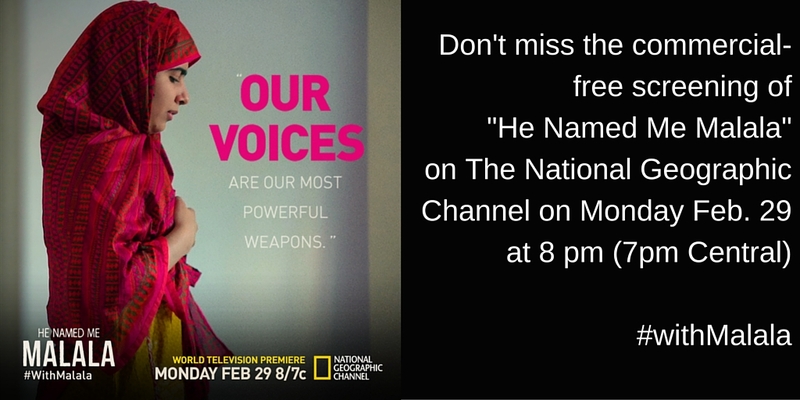 The National Geographic Channel broadcasts the documentary He Named Me Malala on Monday, February 29 at 8 pm. 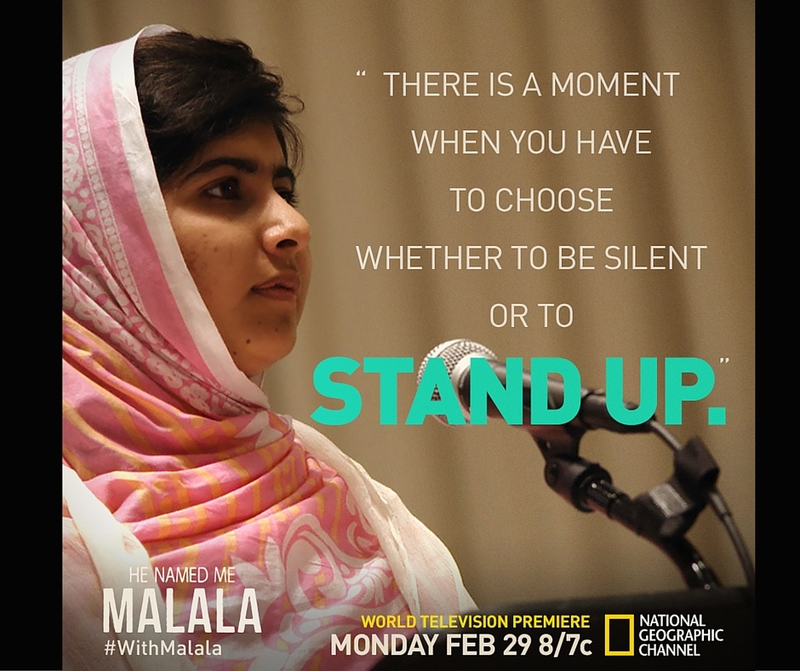 This powerful documentary shares the story of Nobel Peace Prize winner Malala Yousazai. When 11-year-old Malala Yousafzai began detailing her experiences in the Swat Valley of Pakistan for the BBC, she had no idea what momentous changes were coming in her life. I received a complimentary screening copy of the documentary film He Named Me Malala and the book I Am Malala by Malala Yousafzai. I am so proud to collaborate with the National Geogeographic Channel and others to share information about the upcoming screening. Acclaimed documentary filmmaker Davis Guggenheim follows the story of Malala, her school teacher father Zia and her family. You may recall that in 2012 Malala Yousafzai suffered a gunshot to the head while riding home from school. She was singled out for expressing her views about girl’s right to education. HE NAMED ME MALALA is an intimate portrait of Malala Yousafzai, who was wounded when Taliban gunmen opened fire on her and her friends’ school bus in Pakistan’s Swat Valley. The then 15-year-old teenager, who had been targeted for speaking out on behalf of girls’ education in her region of Swat Valley in Pakistan, was shot in the head, sparking international media outrage. I have followed the story of Malala since I learned of her shooting in 2012. She was fifteen at the time. I remember asking myself if I would have been so brave as a fifteen-year-old girl and continued to fight for what I believed in despite knowing I was in danger. I find her positivity and efforts to promote safe, quality education inspiring. She would be justified in feeling frightened, angry or bitter after this experience. Instead, she thinks of her attackers with compassion and uses her experience to create a better world. She continues her education while campaigning internationally, with The Malala Fund, to allow more girls access to safe education. The documentary was informative, educational and inspiring. I also enjoyed the lovely animation sequence. 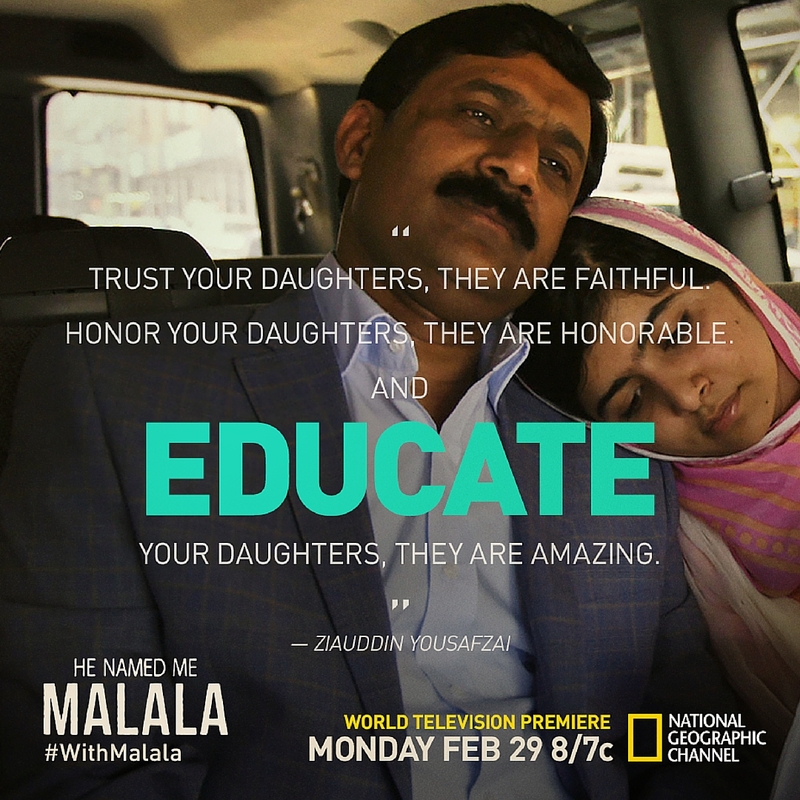 I feel He Named Me Malala is a wonderful film for the whole family as it explores the value of education. So many of us take education for granted, yet so many girls (and boys) throughout the world are denied access to safe, quality education. 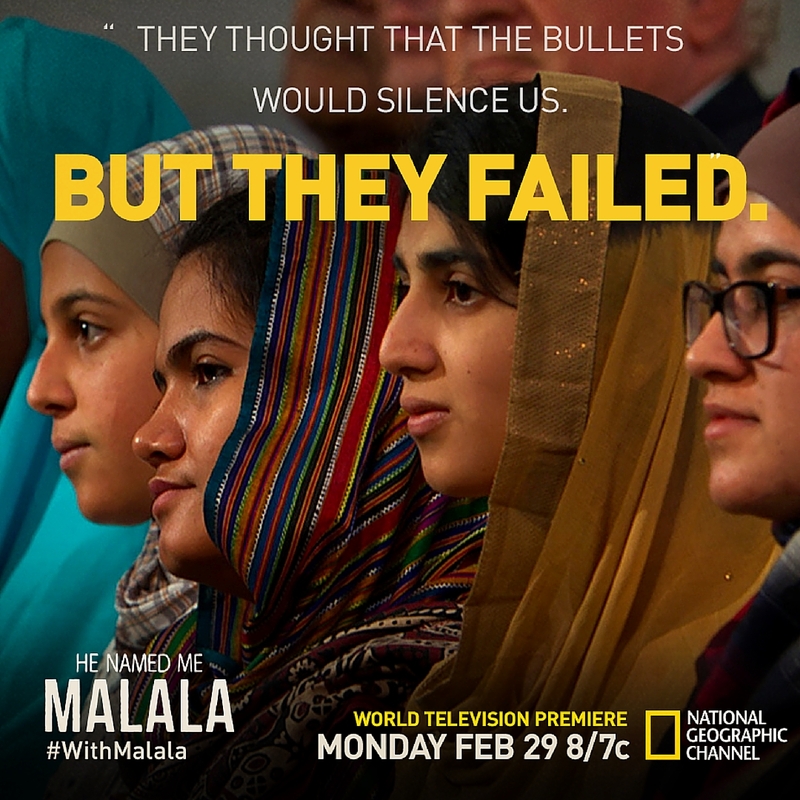 For more information on the National Geographic Channel’s upcoming screening of He Called Me Malala, visit the National geographic Channels education resources about this film. Do you enjoy documentary films? I enjoy learning about our heroes who are willing to stand up for what they believe and who strive for positive change in the world. Who do you consider a hero? Do you have any inspiring books or films to recommend? I wrote this post on behalf of Review Wire Media for 20th Century Fox and The Mission List. I received information to facilitate my review as well as a promotional item to thank me for my participation, but no other compensation. All images were provided by the National Geographic Channel and The Malala Fund. My son was home sick yesterday and we watched this. It was amazing. I’m going to dvr it again for my other kids! What a wonderful way to use a sick day! I hope he is feeling better now. I had not heard of this before! I will have to see if it I can find it to dvr what an amazing young woman. What happened to her was absolutely terrible. Honestly I can’t wait to see this film this is one of those that nobody should miss. I have our dvr set to record this. Just in-case my girls are not avaible to watch it while it airs live. Such an important topic. We will be watching it together. I live watching National Geography and this is sad what happened to her. Thanks for sharing!! I wish we had the National Geographic channel. This He Named Me Malala sounds very interesting to watch. Hopefully they have it on Netflix since from time to time they do have features there from National Geographic. i haven’t checked Netflix, but imagine ti would be there in the future if not already. 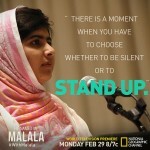 It is so important to learn about and share the message of the life of beautiful strong women like Malala. Can’t wait to tune in. I don’t have the NG Channel but I need to have it added. I’d really like to see this documentary. I know it is available on DVD and I think Blue-Ray. I would imagine that it will be on Netflix if it isn’t already. I’ve been seeing a lot of posts and some commercials about He Named Me Malala, but didn’t really know what it was about. After reading your post, I’m a little more educated about it. I will probably record the documentary and watch it at a later date. This was an absolutely amazing story, but for adults and the young readers edition. I am definitely going to see this movie when I get the chance! I am making a point to watch this. What hardship and what resolve she has. Amazing! What an incredible story this looks like. I am almost to reading her book – just one more to get through, then I expect to be completely inspired. So many books, so little time! Her book is on my reading list as well. I’ve heard quite a bit about this. Looks and sounds interesting and so very inspiring. It’s an amazing story. Thank you for visiting, it is great to hear from you. I agree she is a great example for people throughout the world. I can’t wait to see it! She has an incredible story to tell. Everyone can learn something from this young woman. This is going to be an amazing documentary. She really has inspired so many woman and girls. What a beautiful woman she has become. I can not wait to see this documentary. I love documentaries, and this one was great! My youngest walked in the room as we were watching this one, and I had to really hold back tears when I told her about Malala. I missed this documentary but I will get a copy so I can watch it. Thanks for sharing.